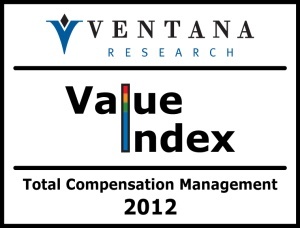 We have just released our 2012 Value Index for Total Compensation Management (TCM), in which we evaluate the competency and maturity of vendors and products. Our firm has been researching this category for many years, and our latest benchmark research in total compensation management found some improvement among applications in a field where many organizations still use outdated applications to manage an area with large financial and human capital impacts. I am excited to bring this research to market again this year. No other research firm performs this level of analysis or follows it up on a regular basis. 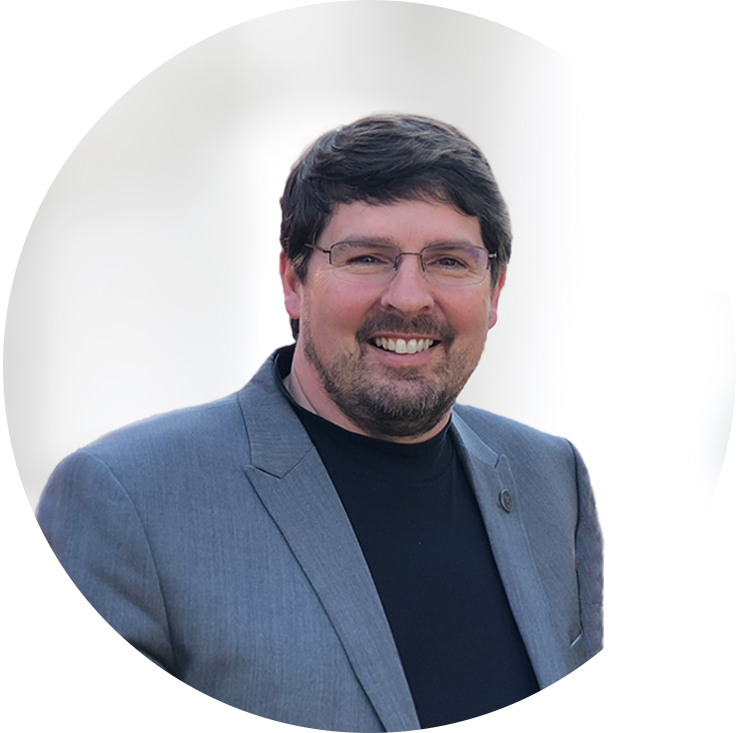 The Ventana Research methodology utilizes a request for proposal and assessment approach, and each value index takes six months to complete; unlike other analyst firms, we look at the product details that have the most importance to successful adoption and use. In the process we identify best and worst practices that further refine how we assess technology vendors in this category. Our research, including this Value Index on Total Compensation Management, looks at the complete range of aspects of compensation, from types of pay and benefits to the processes required to manage them and communicate with workers. We examine role-based requirements for an organization, as well as integration with performance and talent management. We look closely at the key product areas – usability, reliability, manageability, adaptability and capability – and also the customer assurance areas of validation and TCO/ROI. A lot has changed among TCM suppliers in the past year. 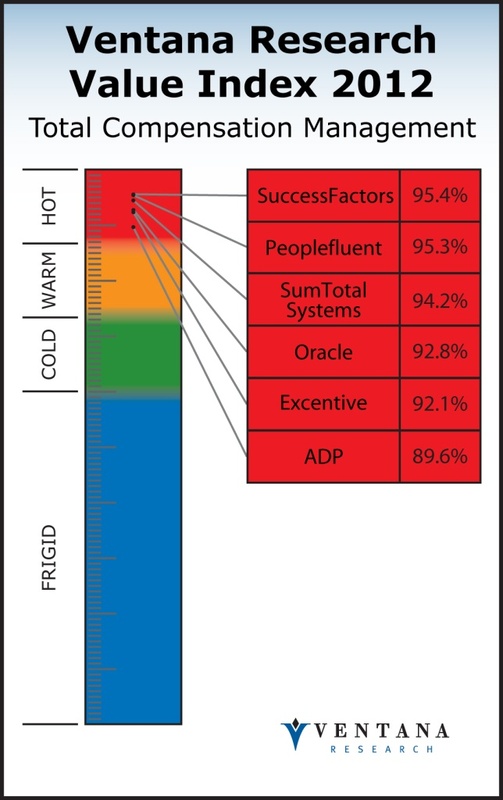 For instance, Plateau, which we rated Hot in 2011, was acquired by SuccessFactors, which in turn was acquired by SAP. Now SAP is focused on using SuccessFactors offering and placing the product investments on this offering. Taleo was acquired by Oracle and its product was put aside in favor of the newer Oracle Fusion Compensation Management. This year we found many talent management vendors claiming to manage compensation, but some provide only a place to enter current compensation data for use in performance reviews or provide limited capabilities. These vendors lack a total compensation management approach that can be used across all roles – administrator, management, manager and employee and support the processes, communicated and integration required for meeting these needs and support of talent management. Our Value Index methodology assesses vendors across the seven categories noted above, each weighted according to its priority to buyers, and sums the results to 100 percent for scoring purposes. We placed a heavier emphasis this year on usability, reliability and manageability, which organizations indicated in our benchmark research are increasingly higher priorities. You can read the details on our methodology and process in the full TCM Value Index report. Our analysis in the 2012 Value Index found six vendors that provide robust offerings. All six are rated Hot, which is the highest value level and demonstrates maturity of offerings. SuccessFactors ranks at the top, closely followed by Peoplefluent, then SumTotal Systems, Oracle, Excentive and ADP. We noted in our analysis that SuccessFactors and Peoplefluent showed rapid product advancements every quarter, and their focus on usability, manageability and reliability helped raise them above last year’s ratings. Oracle is a vendor to watch, with its latest release of Oracle Fusion Human Capital Management, which includes compensation and is available both on-premises and in the public cloud. New to the Value Index is Excentive, which is dedicated exclusively to total compensation management. We take a lot of pride in our Value Index, and we believe it is cool to be a Hot vendor. The competitive market for these applications comprises a very mature set of products. Congratulations to the vendors that survived our detailed assessment processes and granular analysis, which represent how organizations assess and select vendors. If you want some further information, you can download the executive summary. We look forward to offering continued guidance to buyers on this critical application category for HR, finance and operations professionals who need to engage and retain employees by taking a comprehensive approach to compensation management and applications.